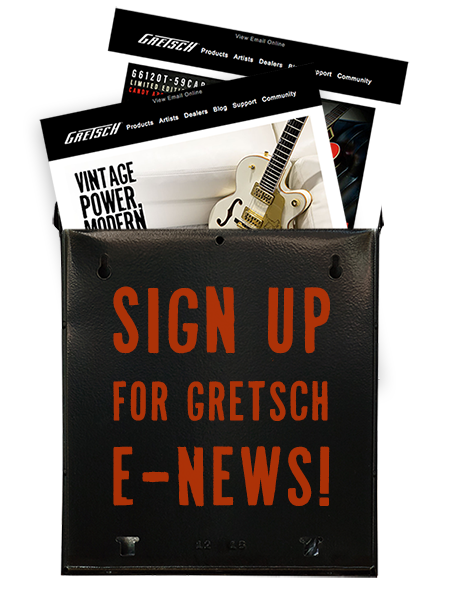 The Gretsch Showcase, with its colorful and stylishly designed guitars, seems to be an eye-stopper every year at the NAMM show in Anaheim, Cali. Country western singer/guitarist Lynda Kay with Kim Falcon. Neon Trees bassist Branden Campbell stops to test out a Gretsch bass. Airborne Toxic Event drummer Daren Taylor came through the showcase sporting our Gretsch “Since 1883” field bag. And thanks to the stunning display featuring the Gretsch Custom Shop G6128T-GH George Harrison “Tribute” Duo Jet guitar and other Harrison memorabilia, the Gretsch booth proved to be an even larger attraction in 2011. For instance, although Keith Urban was on his way to the Fender Custom Shop booth, he couldn’t help but notice the Harrison display. The country superstar stopped and watched the nearly four-minute long video, also available now here, that tells the story behind and making of this unique guitar. Rest assured, this was a repeated occurrence throughout the weekend because as beloved as the Beatles and George Harrison are, the tribute model quite simply stole the show!